Curious to know what it’s like to spend a summer sailing in Greece? Stay tuned each week to learn more about the cruising lifestyle as told by one of Zizoo’s favourite sailors, Georgina Moon. 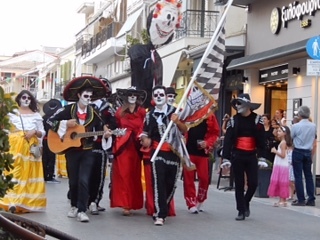 This week, Georgina shares her experiences of celebrating Carnival in Lefkas. Hello! My name is Georgina and me and my husband Tim are from the UK. Every summer we leave the unpredictable British weather behind and move onboard our yacht ‘Fandancer’ which we keep in Greece. For five or six months every year, we sail around the islands and coastline of Greece, exploring new harbours and anchorages. Every fortnight I will be writing about new adventures and life aboard Fandancer…. Yachts passing through the floating bridge. 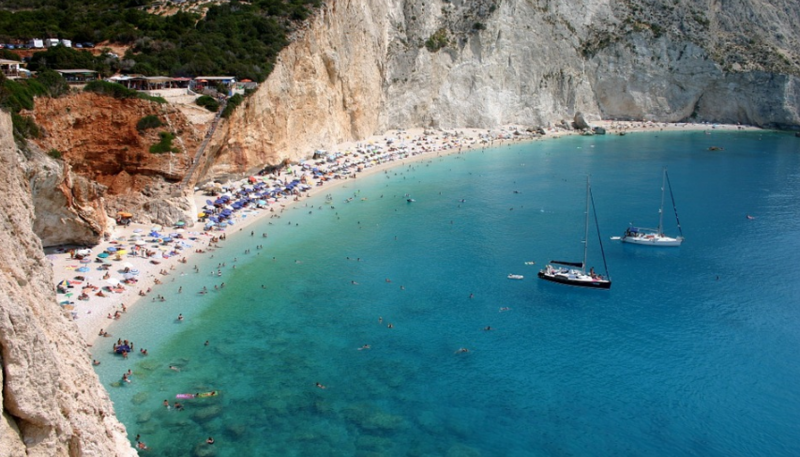 If you join your charter yacht in Lefkas, you will fly to Aktio airport at Preveza, which is a short distance by bus or taxi to Lefkas town and marina. Over the last few winters, we have kept Fandancer in one of the boatyards in Preveza, which is very close to the airport. After we launched our boat, we headed south to Lefkas, which is an island, joined to the mainland by a narrow road which crosses a floating bridge. The bridge swings open once an hour to let the boats and yachts through. 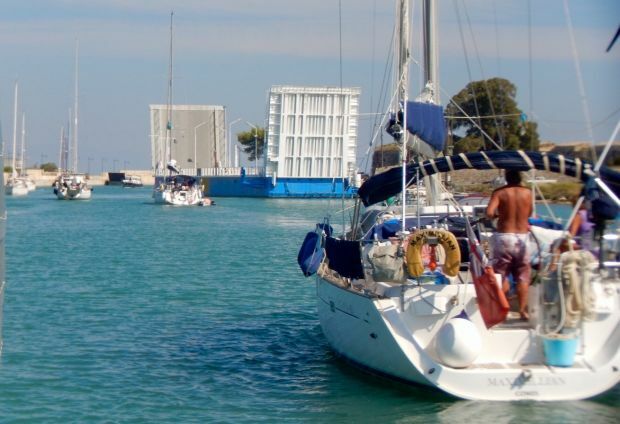 A siren is heard when the bridge is about to close to road traffic, and it is important to be ready on your yacht, as it only stays open for a short time, for boats to pass through. If you pick up your charter yacht from Lefkas, you may choose to go through the floating bridge and sail in the northern Ionian, where you can visit the islands of Corfu, Paxos and anti-Paxos, as well as many beautiful mainland coastal locations such as Sivota, Parga or Platerias. Lefkas is also an interesting place to explore if you visit by yacht, especially the old town, with its narrow streets, many churches, and an impressive square where many people gather each evening. While we were sitting there last week, we heard a musical procession approaching, and found out that it was the performers from Festa del Canale – the local canal festival, dressed in magnificent costumes and makeup. Later, as the sun began to set, lots of local people walked down to the waterfront, where a small stage was set up over the canal. 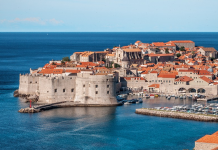 Many musical acts performed, including school children who released floating balloons, modern dancers, people in traditional folk costumes, and we also saw several old boats which were ornately decorated and transported more performers in a tableau along the canal. There always seems to be something going on in Lefkas town – they host an annual international dance festival, jazz musicians often visit, and there is an open-air theatre where ballet and opera are regularly performed. We would definitely recommend that you take some time to explore Lefkas town at the beginning or end of your charter boat holiday. Want to spend a summer sailing in Greece? Check out our sailing guide to Lefkada (Lefkas) and find the right boat for your next sailing holiday in Greece with Zizoo.